I often think I can read and relate to the emotions my pets’ exhibit beyond the wag of a tail or a yelp at the wrong end of a bee. Other times I struggle to interpret what their behavior means. This brings me to a recent and favorite story I have been watching over and over. A viral video demonstrating animals and humans display very similar emotions brings smiles and tears simultaneously. It is part of the story of a goat and a burro. You see, Mr. G the goat, was depressed after being rescued from a hoarding situation and separated from Jellybean, the burro. 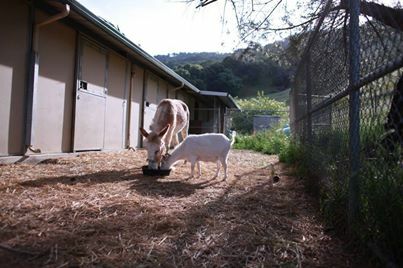 Mr. G the goat, was depressed after being rescued from a hoarding situation and separated from Jellybean, the burro. More businesses are finding video content is boosting business and helping get attention. If you can create a popular viral video; your business name could soon become a common household phrase. A new online video playing on thousands of computers may just do that! Online video is helping many small business owners connect with consumers and open new markets. To learn more about the growing explosion of online video click here.